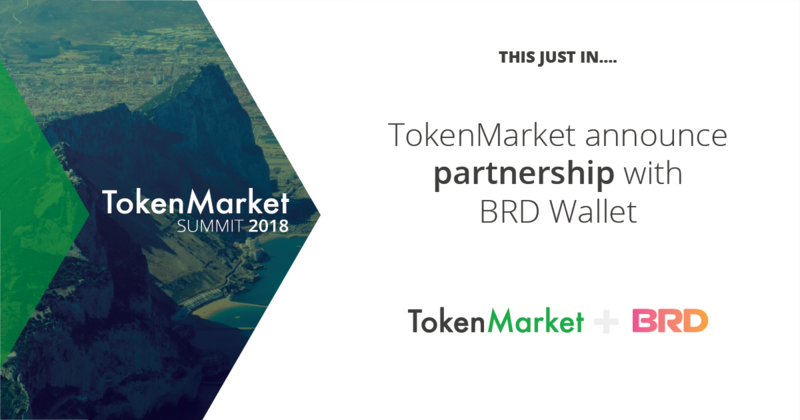 TokenMarket has partnered with BRD Wallet to integrate its system into the current ICO contribution platform. This will facilitate cryptocurrency users to contribute into upcoming ICOs listed on TokenMarket. Head of Business Development, Ryan Hanley revealed the partnership at TokenMarket’s 2018 Summit: ‘Insights into the Economy’. BRD (formerly Bread Wallet), the most secure bitcoin and cryptocurrency mobile wallet, trusted by users in over 170 countries, has partnered with TokenMarket to simplify the crowdsale process for institutional and retail contributors of Initial Coin Offerings (ICOs). The partnership greatly reduces the complexities for participants in future ICOs whilst giving companies a complete platform to manage its presale and crowdsale processes, including: Contributor registration (KYC), real-time adjudication of transactions, and token sale completion. TokenMarket will continue to provide leading advisory services and implementation expertise to blockchain based companies looking to launch a token sale. The anticipated release of this new offering from BRD is August 2018. Working alongside TokenMarket, the BRD Wallet will allow their users to buy into upcoming ICOs that are all listed on TokenMarket’s website, as well as traditional cryptocurrencies. Users will be able to directly purchase into an ICO that TokenMarket has listed on the ICO calendar, meaning that real time results and projects will be found at their tips of their fingers. This announcement comes as the first in a wave of many new partnerships for TokenMarket made at the 2018 Summit in Gibraltar.